I am so excited to share the completed craft room makeover today! Hubby and I worked hard on it all summer long. And let me tell you – it feels gratifying! But first, let’s take a step back in time to February. Isn’t that scary?! Now this one takes a lot for me to put out on the internet, but it is absolutely real life. Messy, messy even though that room is actually clean. I just had NO WHERE to put anything. I honestly did most of my crafting on the floor and I bet some of you know how that experience. The opposite wall (not pictured) is my husband’s desk and office space to do what he wants with. Ok, moving on to the craft room makeover finale! Are you ready for this?? Obviously, this craft room makeover was no weekend project as everything in this room was either DIY transformed or custom-built. In fact, the only item purchased as is was the office chair I think. The main drivers of my design is that I wanted an artist’s office with craft supplies on full display, not tucked away in cabinets and boxes. Because my supplies are quite colorful in themselves, I chose not to pick a specific color scheme and just use what I love. Funny how that worked out though and the room looks put together. Otherwise, I kept everything mostly neutral and light. There is no overhead light (yet) in this room so I took advantage of the window light to bounce and brighten the room. So let’s start with all the wall organization units, shall we?! On the far corner, I made my son an art station with a gallery wall and a special space for his supplies. You can read more about how I did that on my children’s art gallery tutorial. If you saw my Craft Room Inspiration post, you know that I really wanted a wall organizer for all of my craft supplies. I wanted to display my art supplies and utilize their rainbow of colors. Hubby and I designed and built this wall unit. It’s very simple and I love it! Here is the link to the tutorial and our plans which are easily modified. I included several new and old pieces to suit my needs. The black multi-drawer organizer is one I swiped from Dad’s garage (with his permission, of course). I feminized it up as shown in this post. I also purchased 3 mail sorter bins and a mdf backer board. I spray painted them a vibrant coral color. I added the “Ludicrous ideas just need good plans” quote which is one I came up with at like 2am after reading 100’s of quotes by other people and finding nothing. For a DIYer, that quote “gets it”, lol. Hubby and I built these boxes which serve several purposes. The countertops are recycled from our old kitchen renovation (as in free, ya’ll!). Under that box is a huge hole that needed covered however. I added some storage caddies and hubby wired them up so that I could have outlets above the countertops. The last area is my computer area and pegboard. 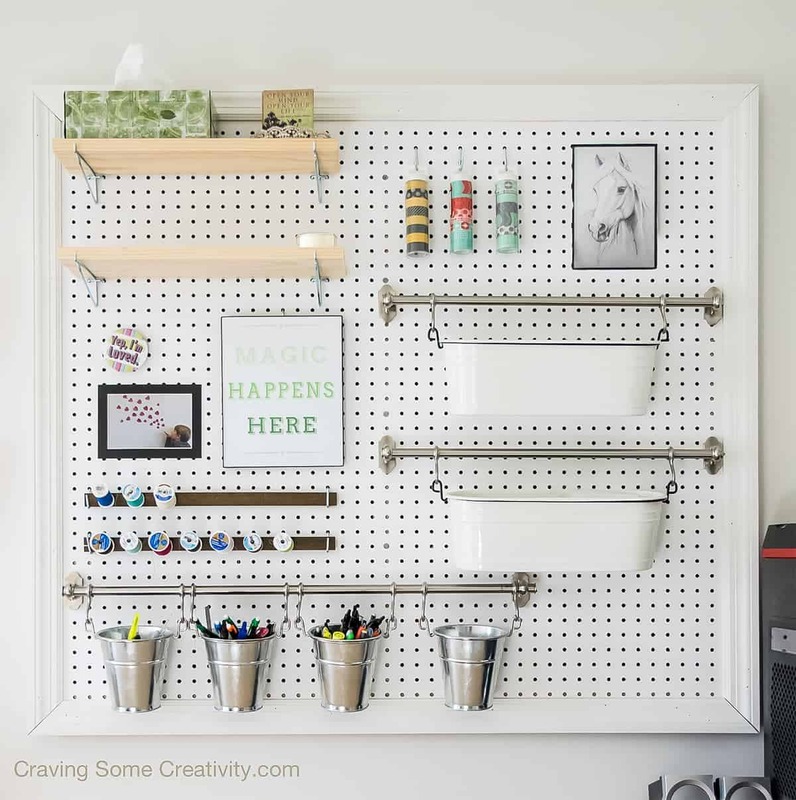 A pegboard was one of the first items I knew that I wanted for the room. I based it off of the one I found from a Beautiful Mess and added some Ikea storage bins to hold my adhesives, pens, pencils and a few items that are special to me. Like most pegboards, I can rearrange the items in case I need more room to grow. The full tutorial for making your own pegboard organizer is also posted here. I don’t think any craft room makeover is complete without a Kallax from Ikea. I don’t know why, but I love them in all their boxy glory. I put my scrapbooks on the bottom shelf and the bins hold fabric, ribbon, punches, and vinyl supplies. I made a vignette on the top with my jungle animal cabinet (that began life as a Burger King dessert display case). I was really into animals growing up, especially exotic ones. I can still remember painting that in high school and I can’t believe it has survived so long. I already had the paper sorters and organized all of my cardstock and patterned scrapbook paper in them. Love the rainbow! However, the biggest DIY project was the cabinets. We found a contractor on Craigslist that did kitchen renovations and we purchased 13 oak cabinets for $325. Since I only needed four base cabinets, hubby got the rest to put in his garage workspace. I’ve painted furniture before but these are extra special. With a 6 year old and his art supplies, I knew that white was really risky. I mean the kid is up at 7am every morning pretending to be the loudest ninja in history. Seriously, he is superb at explosion sound effects. So my cabinets need to be durable. Although I will detail in another post how we did these cabinets, I will say that we used a high quality, non-yellowing clear coat made for painted floors. I knew that a product meant for floors would give my cabinets their best chance against my little loveable tasmanian devil. Although the sheen is a tad more shiny than I originally wanted, they are super protected and won’t stain. Click here for more inspirational craft room ideas! 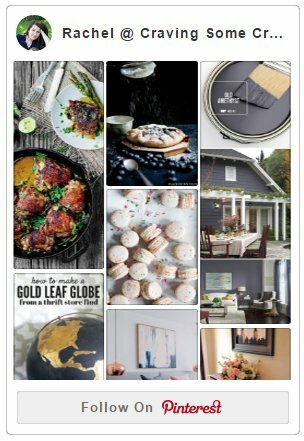 Also, check out the menu bar at the top of the page (the menu symbol on mobile) for links to TONS of projects, printables, and DIY crafts. 1. Cabinets – these were a craigslist find from a kitchen renovation. We purchased 13 cabinets for $325. I only used 4 so my cost was $100. It’s such a dream now and I feel inspired and comfortable in my new room! I sit here typing up this post and looking around in awe. I can’t help but smile and, dare I say, beam with a little DIYer pride. What do you think? Do you have a dedicated space to craft and call your own? What a great transformation!! My craft room currently looks JUST LIKE your before picture. Transforming it into a real studio is on our list of things to do the next few months. Your big reveal has inspired me to get started on my space!! Thank you for sharing!! Hi Lynnette! Oh that is such a beautiful thing to say and it warms my heart. I love having a space my own that I can work on all my projects and future plans. I know that you will too! So excited for you! This is so amazing! I can’t believe that this is the same room 😮 and all of them are DIY transformed and custom-built 😮 The result is so awesome! Hi! I love your craft room! I would have liked to see how you organized those kitchen cabinets though 🙂 maybe next time! Thank you for sharing! I will be doing the same here soon but your blog really helped! Thank you for your kind words and I am so happy to have helped. The organization of the cabinets isn’t really all that special. I am a big fan of categorizing items to keep them together so the cabinets are mostly organized by type of craft. For instance, one cabinet is my sewing machine and accessories. Another has my printer/silhouette cameo/vinyl and the third one is pretty much everything else (markers, a paper cutter, paper, cards, etc). Also the drawer set on the end is my son’s art area to store his supplies and small toys. The bins on the IKEA cubbies are sorted by paper punches, fabric leftovers (x2), ribbon, aerosol cans, and glue gun/corded tools and accessories. Good luck with your project! I am sure you will be very happy; I know I am! First, and most important, I really enjoyed your article. I’m looking forward to reading more of them. Your craft room is lovely. One of my biggest challenges is paper storage. Does your paper sorter hold 12×12 paper? That’s a requirement for me. Hi Linda! I know your pain with finding paper sorters that will fit 12×12 paper. The black one that I linked to is the closest I could find to my own and measures 13 wide, 9 1/2 front to back, and the top to the bottom is 10 7/8 inch. So they will fit 12×12 but there is some overhang, which I also have in mine. That doesn’t bother me, but if you are looking for a true 12×12, there are these desktop stackable paper sorters in clear: http://amzn.to/2mK4IS1 or this one: https://www.scrapbook.com/store/ac-375798.html?t12-13=crate+paper&t2=storage+and+organization Hope that helps! Thank you! Thank you! Thank you! It helps immensely. We moved two years ago and I was supposed to have my own scrapping room. Suffice it to say, it hasn’t quite worked out that way – children have moved out, moved back home with children, and moved out again. Now my room is empty again and in a moment of clarity, I realized I have enough “stuff” to fill a small store! Hmmmmm, I wonder how that happened? The problem? I don’t know where to start. I feel like I’m simply moving really cool things from one place to another and not solving the problem. Do you have any suggestions? Just now, my husband very sweetly said, “You DO know you still have four containers in the shed, don’t you?” As an FYI, said containers are the size you can fit a dead body into. Someday I’ll have a room as beautiful as yours, but first I’m going to work on having a place for everything. Absolutely love your crafting space! You mentioned you didn’t want anything behind doors and yet all looks so neat and tidy. I’ve been looking for ideas on how to fix my craft room because it can be seen from the living room and needs to be pretty and tidy. Do yo mind telling me the dimensions of your room? Thank you and again congrats you did a great job. Awww, thank you so much! Actually, keeping my craft supplies on display like I did had a good side effect that I keep it more tidy. It makes makes it easy for me to put away fast and find it again. I used to be terrible about putting anything away until I was completely done with it. The room is really long and narrow. The dimensions are about 16’x9′ and my husband’s office is actually on the opposite wall of the same room. Love the peg board. I use wire baskets and small pails on mine. Very nice job! I am in the process of creating my craft room and found yours on Pinterest. It is lovely! I agree with you about the peg board. Definitely going to have one in mine too. Hi, you mentioned in the piece that you used a non-yellowing clear coat made for painted floors to go over the white paint. I’m wondering if you’d share what brand you used and what the product was actually called. I repainted our kitchen cabinets with a kit, but the top coat did result in a yellowish tinge. I repainted again and have been looking for something ever since. You’re also welcome to email me if you’re able. I’d really appreciate it. It’s an amazing idea and room, and you’ve inspired me to do something similar in my craft room. Thanks and hope to hear from you soon. I emailed you with the information. Let me know if you didn’t receive it. Really, really pretty and inspiring work space! I am so happy for you :o)! Looks gorgeous. This office makeover is GORGEOUS. I can only hope my office looks this great if I ever get it done! lol! I am featuring this tonight on The Creative Corner! 100% pinned! love this makeover! I have a space that needs s little inspiration and I think that I just found it! Thanks so much for sharing this on MMM! I LOVE how it turned it! It looks so great and the colors are perfect! Have fun creating in there. This room turned out amazing! I love the amount of workspace and organization you have and the fact that you did it all in such a cost effective way. I am definitely going to pin this post in case I am ever lucky enough to get to create my dream craft room. Wow, your craft room is amazing, I just fell in love with it!! And the idea of your kid art display is perfect, I think I’ll do something similar for my two artists. Thanks for sharing! Awesome job! I love how you used all of the color that comes with being creative. I think it makes it fun and so much more cohesive! This looks AWESOME! I especially love your art station and how you made a place to hang your children’s artwork. That is so precious! It looks so good, Rachel! Love all the pretty details! Oh. my. gosh. This room is a total DREAM!!! I’m so jealous right now. Haha But I know tons of work went into this space. I’ll be featuring this Thursday at our Your Turn To Shine link party. Thank you so much for sharing it!!! This room is amazing! I love so many things in here. I agree that letting all the craft material colors be your color palette was that way to go. Great job! I have craft area envy now! I love how you utilized the wall space to hold so much stuff. I have a peg board but that is all the wall space I have in my nook because I have a big window (I’m not complaining about the window, but it does look out to under the stairs to my deck). I think I can use some of your inspiration though! Aww, thank you, Kati! So glad you found my craft room inspiring. I have seen some cute ideas with shelves over the window that might give some more wall space. OMG!!! This is truly amazing. I am in awe looking at it. The white makes the colors of the craft products pop and I love everything about it! Nice job. 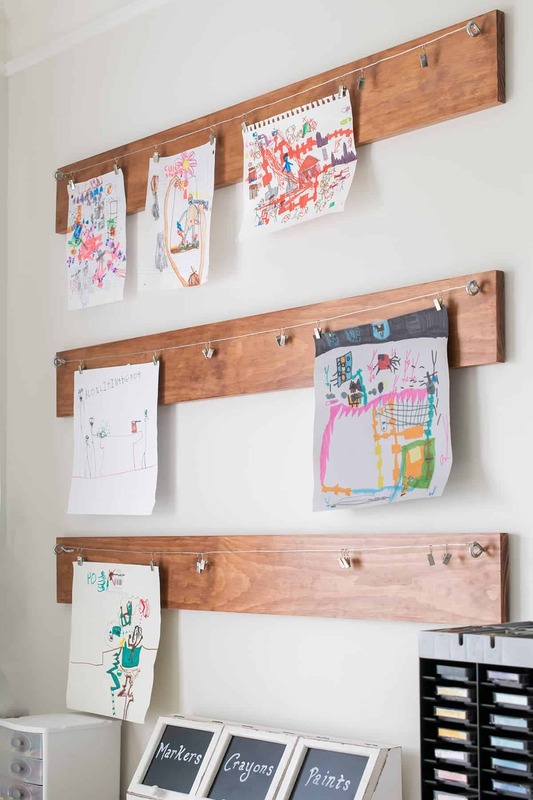 I love your son’s art gallery wall and the peg board! Your craft room looks fabulous!! LOVE IT Rachel! Genius reusing your old kitchen countertops and what a steal on those cabinets! Yes, they were awesome, but the original condition of the cabinets was no where near what they are today. Thanks for stopping by, Amanda! I have really missed blogging because of sweet people like you. Oh my goodness, I am officially in love with this craft room. I need one SO BAD!!! I’m pinning this and I can’t WAIT to do mine. So glad I found your cute blog! Gorgeous! Great job–I have some serious craft room envy now. There’s room for you Meredith, but maybe you can design our upstairs bathroom, lol. It’s a downer right now for sure. So glad you like it because you are pretty inspirational yourself! WOW! looks amazing! You rock! I want a room like that too. SWOON! I am drooling over your craft room. Someday…sigh. You’ve done an amazing job with this! Thanks! This is the first real craft room I have had and I love it so much. WOW! Quite the transformation! Loving (and am slightly jealous) of your crafting space! Great ideas! What an amazing transformation! It looks amazing! I especially like how the outlets are above the table. Brilliant! I will have to show that one to my husband. I have a corner of my daughters room that I took over. She is at college, but still comes home and uses the room. I try not to spread out too much!!! Thanks for sharing your wonderful room! Wow, I’m so jealous. This is such a great space. I’d love to have so much room dedicated to crafting. Looks amazing. Thanks for sharing! I love the reveal of your craft room! What a lot of work that went into it. I am in the (long) process of creating my first craft room also. Wow you sure were busy this summer. 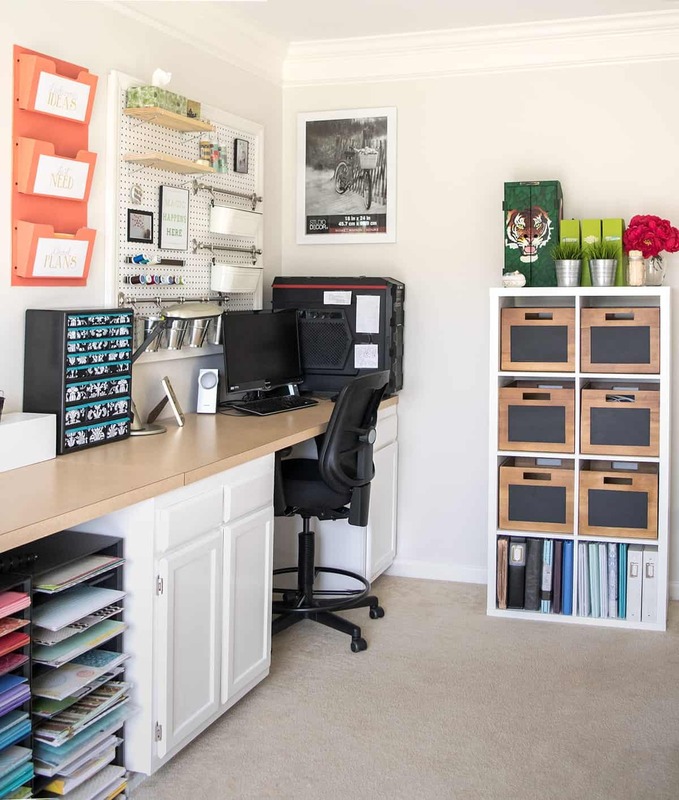 Your craft room is gorgeous and it must feel so nice to have a place to work and have everything organized. Fabulous job! Thanks so much, Erlene! I thought that the super busy nature of summer would wind down when it was over. Haha, nope! Wow! Your craft room is absolutely GORGEOUS, Rachel! Looks like it’s right out of a magazine! I am not a crafty person at all, but I kind of want this room now! 🙂 Love it! Wow. That’s just the most amazing craft room I’ve ever seen. Pinterest worthy for sure! I’m completely jealous of how pretty your craft room is! Love it! Awww, thank you so much! And now that it’s done, I find myself going the extra mile to keep it clean. Funny how that works, huh? Ohhh, I LOVE IT! I went pin-happy on this post as I am still working on my office so this is great! Oh, thank you so much, Carrie! I remember we were both doing our offices about the same time earlier this summer and I can’t wait to see yours! Oh my goodness! I’m drooling over here…would love to have a craft room like that! I can’t believe how much you did for $500ish! Awesome job…it’s gorgeous. Thank you so much! It really is a dream come true.